So, I was going to a meeting last week, and decided, being a team player, to pick up a pack of biscuits en route to take for everyone to enjoy. I decided to purchase a pack of KitKats (as an aside did you know that in the Dubai airport duty-free, 1 tonne of Kit Kats are sold every day?) put them on the passenger seat in my car and immediately forgot all about them, going to my meeting without them. It was a hot day, and when I returned to my car several hours later, the packet of KitKats was decidedly warm to the touch. I took them home, and put them in the freezer for a day with the hope of salvaging them. Not too bad, you might surmise, the silver foil looks a little crumpled, but otherwise not too shabby. However, inside they had essentially moulded into a single lump of chocolate, with two biscuits hidden somewhere within, plus they had taken the opportunity to absorb as much of the foil wrapping as possible. 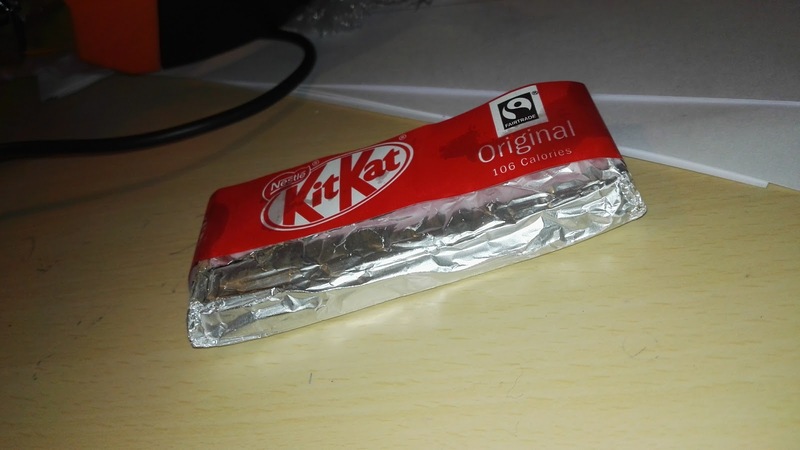 How long does it normally take you to eat a Kit Kat? A minute? Two? 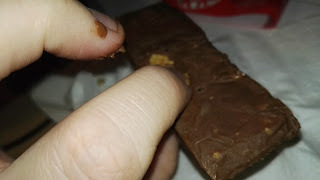 If I'm in a hurry I could eat a two fingered KitKat in one bite, pop it sideways into my mouth, use my tongue to snap it in half and crunch the sucker into a chocolatey biscuit goodness. These babies took a good ten minutes to eat, simply because you had to carefully extract tiny bits of foil from the confectionery, bits of foil which cheerfully ripped into even tinier bits of foil whenever you touched them. You'll be pleased to know that the saga of the KitKats is now well and truly over, each one has ultimately done its duty and been eaten, and I feel that the world is a better place for it.